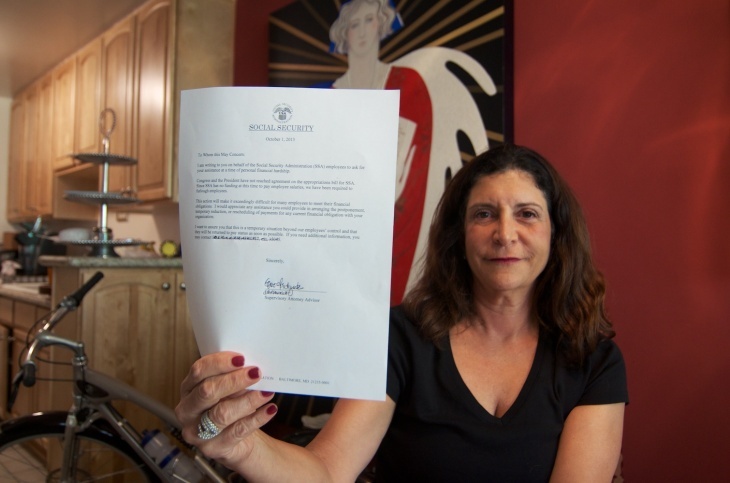 Elisa Wayne, a furloughed SSA attorney, holding the letter she was given to provide creditors - notifying them of her status and requesting leniency. The Social Security Administration announced that during the partial shutdown of the federal government, benefits checks will still go out -- a big relief to millions of people who depend on that income. But the agency has still had to furlough some of its employees. Elisa Wayne is one of them. Wayne works as an attorney in the Social Security Administration (SSA) Office of Disability Adjudication and Review. But on the first day of the shutdown, she was in her downtown LA office for just an hour. She left on furlough with a letter provided by her supervisor, explaining why she might not be able to make timely payments on her bills. I would appreciate any assistance you can provide in arranging the postponement, temporary reduction or rescheduling of payments for any current financial obligation with your organization. Wayne was also furloughed when the federal government shut down during the Clinton Administration in 1995 and 1996. After missing a few weeks of work, she says she was paid retroactively. She hopes that will be the case this go-round. “I’m less freaked out than some of the new hirees who don’t really know what to expect,” Wayne said. An attorney with more than twenty years of government service, Wayne earns more than $100,000 a year. She’s on her own and her monthly expenses include an apartment in Brentwood. She paid her monthly rent of $2500 the day government shutdown began and hopes she won’t have to send one of those letters to her landlord next month. “I don’t have a big cushion between paychecks, like maybe a couple hundred dollars that I can squirrel away somewhere,” Wayne says. Wayne knows she’s lucky compared to the people who depend on her work. When Social Security disability benefits are denied, applicants can appeal the decision in hearings held before judges in her office. But Wayne says she and nine other attorneys working in the downtown LA office are furloughed. On its web site, the SSA says during the shutdown, hearings offices remain open to conduct hearings before an Administrative Law Judge. There are 18 hearing offices in California, including locations in Los Angeles, Downey, San Bernardino, Long Beach, San Diego, Orange, and Pasadena. Wayne says while the judges are still working and supposed to be running hearings, “it's really a farce, because there is nobody there to write the decisions, which I do. " Wayne says that the furloughs are bound to delay an already slow decision-making process for people who are counting on their appeal, and might really need government assistance.